Sunburst began as a Florida only event and prelims were conducted all around the state of Florida and the first state final was held in Ocala, Florida. Word spread rapidly, and within a year word of Sunburst had reached several bordering states and even into the Northeast. Folks were telephoning and writing; asking that Sunburst come to their states. 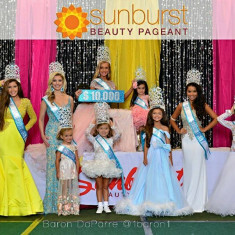 Sunburst rapidly responded to these requests and soon events were being held in Georgia, North and South Carolina, New York, Ohio, Missouri, Kansas, and eventually nationwide. The Sunburst mission was and still is: Provide wholesome competition that not only contestants but their entire family can enjoy. Create an environment where our contestants can grow, mature, develop, and exhibit their talents, personalities, interpersonal skills, and sportsmanship, providing opportunity and rewards, that will further enhance their lives and provide direction as they pursue their ambitions. 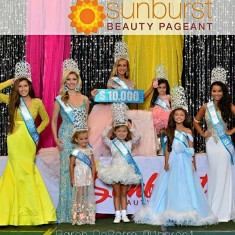 Sunburst has had Miss America winners, Miss USA, Miss Universe, doctors, lawyers, CPA’s, business entrepreneurs, engineers, actors, singers, dancers, musicians, and many other success stories over the years. We are extremely proud of not only who our contestants are but the outstanding folks they have become. Sunburst holds local events throughout the year at venues around the world. The “local preliminary” event is the first step to getting involved in Sunburst. Competition includes babies, (both boys and girls three years and under) and females up to 27 years old. If you are a finalist at your local preliminary then your $250 entry fee is paid to attend your State Competition. State Competitions are held during the months of April and May. There are fabulous awards at the state level including six foot trophies, savings bonds, gorgeous tiaras and much more. Being a finalist in any coordinator at your state competition qualifies you to advance on to the prestigious Sunburst International Finals held in Atlanta, Georgia every year in August. At this final level of competition every winner receives $1,000 with our top score winners receiving $10,000. Sunburst Internationals also has top modeling agencies in attendance whom are scouting for faces and talent that they can represent in their industry as well. Help make your Child a Star!